Prime Minister Netanyahu poised to receive task of building next government after netting support of majority of new Knesset. 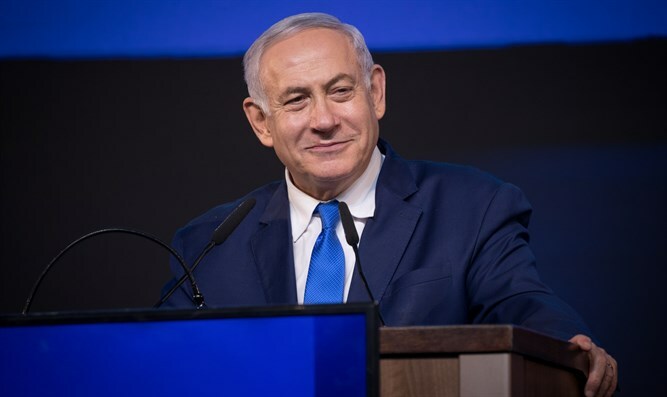 Prime Minister Binyamin Netanyahu has received the backing of an absolute majority of the incoming Knesset Tuesday, effectively ensuring he is tasked with the formation of the 35th Israeli government. Netanyahu, who received the backing of his own Likud party, the haredi Shas, and United Torah Judaism factions yesterday, earlier on Tuesday got the support of Yisrael Beytenu’s five MK-Knesset delegation. Later on Tuesday, the Union of Right-Wing Parties, a joint ticket of the Jewish Home, National Union, and Otzma Yehudit factions, endorsed Netanyahu, pushing him over the top to 61 MKs. As of Tuesday morning, the latest update of the vote count shows the Likud receiving 35 seats, up five from 2015; Shas and United Torah Judaism with eight a piece, compared to seven and six in the previous Knesset; Yisrael Beytenu with five, compared to six in 2015; and the Union of Right-Wing Parties with five seats, the same number its member factions held on the eve of this year’s election. President Reuven Rivlin later met with representatives of the center-right Kulanu party, which was a member of the previous Netanyahu government. As expected, the Kulanu faction also endorsed Netanyahu for Prime Minister. With a projected four seats in the next Knesset, Kulanu’s endorsement pushes the total number of MKs backing Netanyahu to 65. Kulanu party chief Moshe Kahlon is reportedly considering returning to the Likud, which he was a member of prior to the 2015 election. Netanyahu’s closest competitor, Blue and White chief Benny Gantz, is expected to receive the endorsements of just 45 MKs, with both Arab tickets refusing to endorse any candidate. With a majority of MKs behind him, Netanyahu is expected to be tasked by President Reuven Rivlin with forming the 35th Government of Israel. The Prime Minister will have 28 days to sign coalition agreements with enough parties to reach 61 seats, though the president may grant up to 14 days in extensions if necessary. Despite reports regarding talks for the formation of a unity government of the Likud and Blue and White parties, on Monday representatives of Blue and White said they would not join a Likud-led coalition.